You are here: Home Books Rafe Mair - What the Bleep is Going on Here? Although he may be officially retired, Mair will definitely not slip off unnoticed. Mair says that he will continue to fight every bit as hard as any pope ever did. Rafe continues to write articles for news media, contribute to radio shows, and has recently launched his new book, What the Bleep is Going on Here? Rafe Mair arrived a bit late for our interview after having a relaxing meal with his wife understandable, as he is quite a busy man. 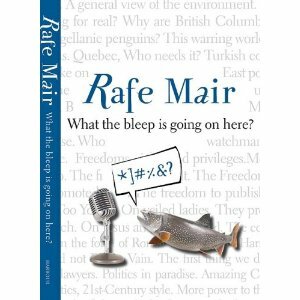 In addition to his print and broadcast journalism, Mair has recently launched a book titled What the Bleep is Going on Here? about current affairs in British Columbia. We had a chat in the entrance to the West Vancouver Memorial Library, and I learned that he is not always as much of a prick as some people would like to think. I was curious about Mairs identity as an environmental crusader, so I asked him what he does on a day-to-day basis to reduce his environmental impact. He said that being the Minister of Environment enhanced his awareness of environmental issues; now, in addition to writing articles and giving speeches to raise public awareness, he is a very active member of Save Our Rivers, a political action group. I asked him why he thrives on the controversy his work is prone to create. Mair figures that he was a born rebel who has always had a sense of independence, and that hes always wanted to do things his own way. It seems Mair never planned to be in radio or on TV, but that these opportunities just presented themselves and he seized the day. He doesnt have a favourite radio station now that he is an iPodaholic, owning no less than three iPods. In his minimal spare time he likes to read, listen to his iPods, and take his dog Chauncy for walks. He is no longer the avid fisherman he once was. One might wonder what motivates someone to continue producing books, writing columns, doing radio shows, and staying active in their community even at the age of 75. Mair chalks this up to his dissatisfaction with the way he spent his first 35 years of life. It seems he is trying to make up for lost time and take action now that he has a better perspective on the issues. Mair looks to the future hopeful that he can make the changes necessary so that things will improve even after he is gone. The book launch for What the Bleep is Going on Here? was quite a low-key event. Mair sat at the front of the room, and his fans eagerly anticipated their chance to ask his opinion on their favourite issue. Mair began by explaining why he continues to work so hard, saying that he wishes he had the idea to start all of this while he was in university because it would have happened a lot faster. He also said that while he may not have a lot of knowledge about all the issues in his book, not having knowledge has never prevented me from having a strong opinion. Mair chose a few chapters from his book to read aloud, including, As Ithers See Us, which begins with a quote from Robbie Burns (O wad some power the giftie gie us / to see oursels as ithers see us!). The chapter consists of a fictional interview between himself and a Muslim named Ali Gazah that is meant to illuminate the perspective of the residents of Middle Eastern countries. He also read from the chapter, Politics 21st Century Style, which talks about the hypocrisy and immorality of the provincial Liberal government. The last piece that he read out loud was titled I Hate the Maple Leafs More Than I Hate The Yankees, a chapter containing what he calls naughty words. Its a general rant on the fact that he loves the Canadiens and hates the Leafs. The audience then had the chance to ask all sorts of questions from Will Gordon Campbell win the next election? (not unless he starts becoming sensitive to environmental issues) to Have you ever considered getting knee surgery? (yes, but it is too risky). Although What the Bleep is Going on Here? has some strong chapters that are relevant and raise important issues, it is also padded near the end with sentimental musings and personal experiences. With his background in law, politics, and radio, Mair is quite well informed on many issues that are relevant to British Columbians, but I don't see how his love of iPods or his frustration at the use of his first name are really relevant to current affairs. In the end I suppose cynicism will always sell, and even though many people may hate him passionately, that has clearly not hindered his success.